Daily Illuminator: The Finale Of Munchkin Comics, In Stores Now! January 27, 2017: The Finale Of Munchkin Comics, In Stores Now! We're two-excited for this month's double-sized, double-covered finale of Munchkin comics, with two all-star stories! Munchkin #25 celebrates the end of our BOOM! Studios comic run with a huge sendoff. Munchkin Czar Andrew Hackard writes two tales, containing more classic characters than you can shake a stick at. In "The Ecology of the Gazebo," illustrated by Phil Murphy, learn about the most dreaded of monsters and how to (unsuccessfully) avoid them. "Brownian Motion" mashes up Moop, Flower, and Spyke for a whirlwind tour through different Munchkin worlds, like Munchkin Oz, Munchkin Legends, and Munchkin Grimm Tidings! Len Peralta gives us his take on these worlds and the gnarly inhabitants. Who thought brownies could be so magically potent? Of course, an issue of Munchkin wouldn't be complete without the special rule at the back, as well as your BOOM! Bookmark Bundle code. Don't forget to use them! It's been a long, hilarious, fun road for Munchkin. We've met a number of talented creatives through the book, and we hope readers have enjoyed it as much as we have! Let's not call this "the end." Let's call this "the end, for now." Pick up a copy (or two – you know you need both covers!) 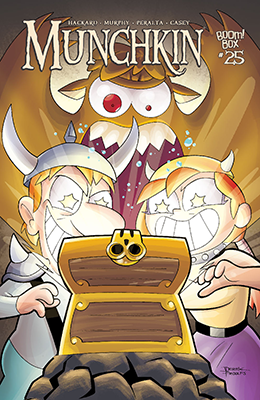 of Munchkin #25 at your friendly local comic shop today!